You may be faced with many tasks and duties demanding your attention day in day out. Without proper planning of the activities, you may end up leaving others out. This could be due to forgetting or lack of enough time caused by poor planning. You will need a tool that will facilitate a smooth flow of activities. 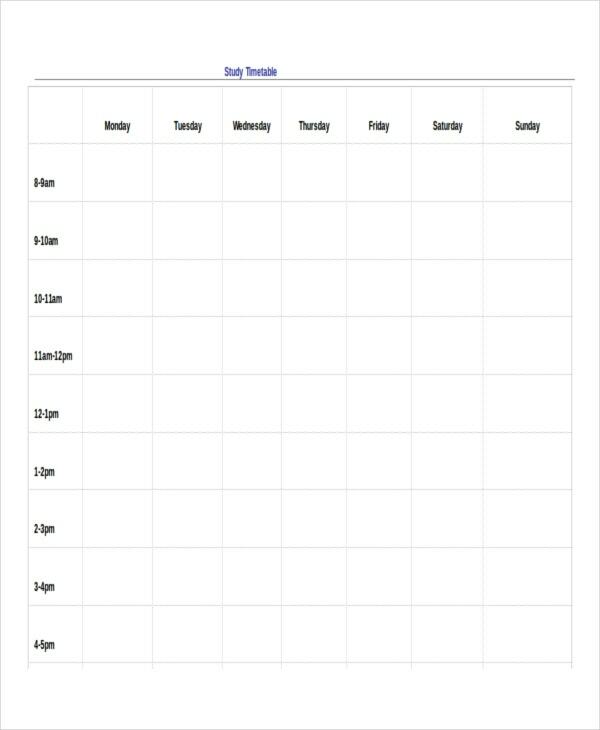 This can be simply described as a Timetable template. School timetable as indicated before is the common and most popular type of timetable template. It provides a guide or a framework that enables proper running of the school. It enables the coordination of the teachers, students, rooms, and time slots or periods available. They vary depending on the level of the institution. There are however various types of this template as discussed below. 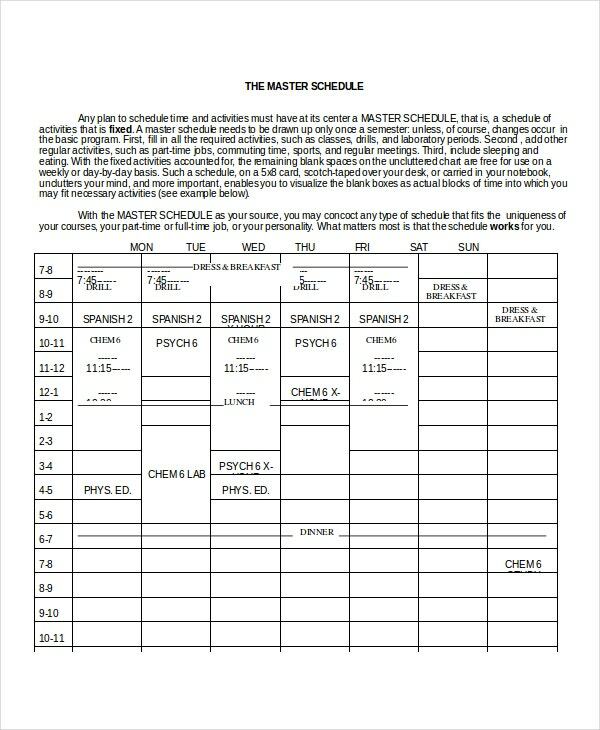 The master timetable is an overall table that contains all the programs of the school. It is detailed, and it contains all the program of all the other classes. In a school situation, it is mainly found in the principal’s office. 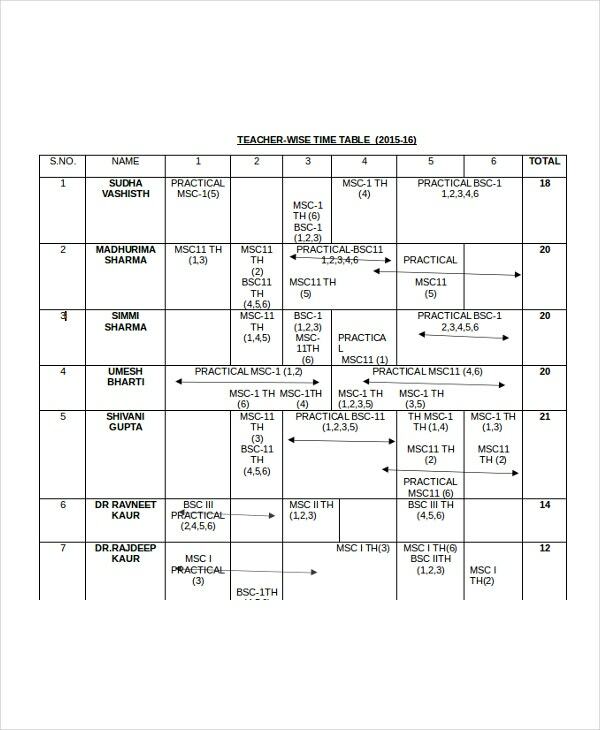 The Class Wise Timetable is confined to a class, and it contains all the activities of the specific class. This includes the lesson that should be taught, the time and the teacher who is supposed to teach.. In brief, they guide the teacher on where they are supposed to be either teaching or any other activities. This type, even from the definition, deals with organizing the games program within the institution. 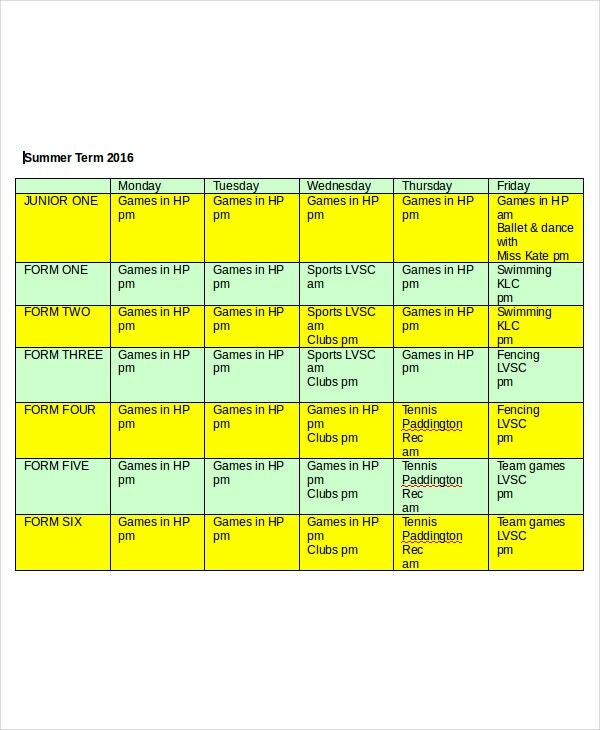 A Co-curricular timetable is the other essential template for an institution. It outlines all the other non-academic activities present and the teacher or master in charge. Students use this to allocate or select the activities of their interest. They avoid cases of duplication of workload and wastage of dynamism. 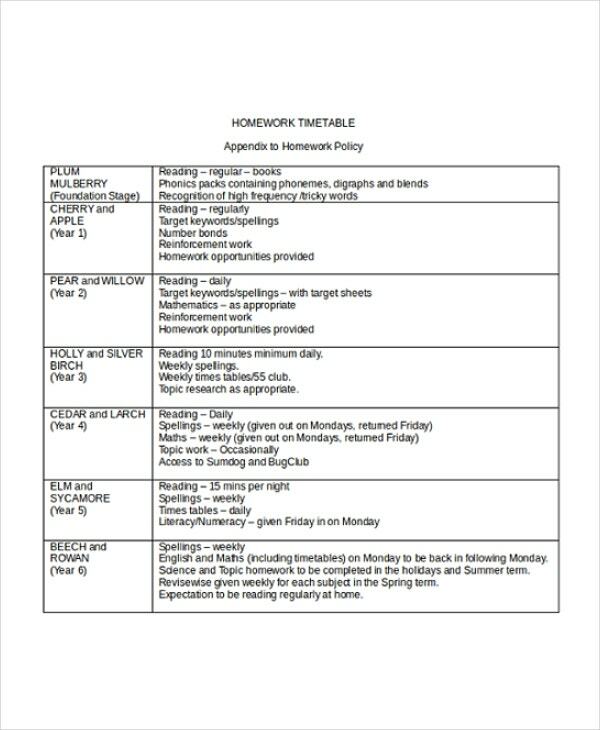 This guides in the creation of a homework schedule that aids students in the completion of assignments assigned to them in school. It also provides a visual assistance to parents that some task was assigned to their child thus provide the essential support. 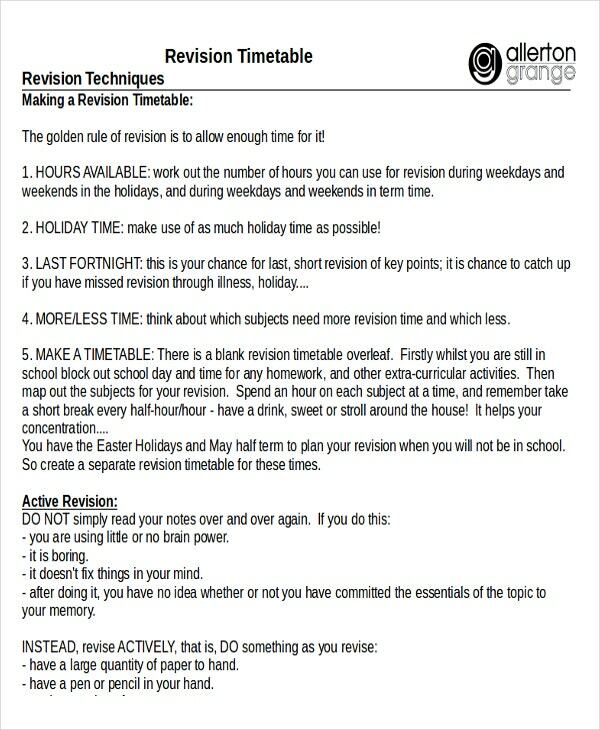 Revision timetable can be described as practical tools that guide any person facing examination during the revision. They aid in strategizing the content to be read and time to peruse. 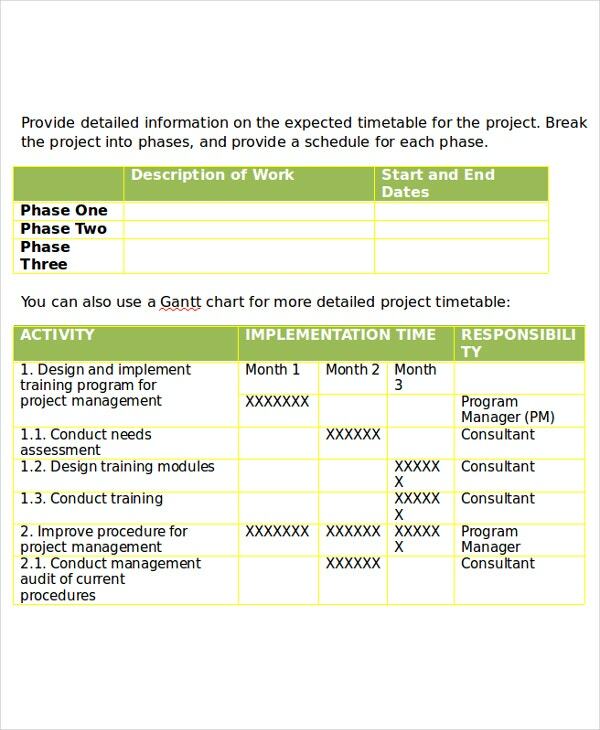 A Project Timetable Template is among the most popular timetable templates. The template outlines the various activities planned to be done and the period. They help in communicating with stakeholders and provide a track of the underpinned activities. 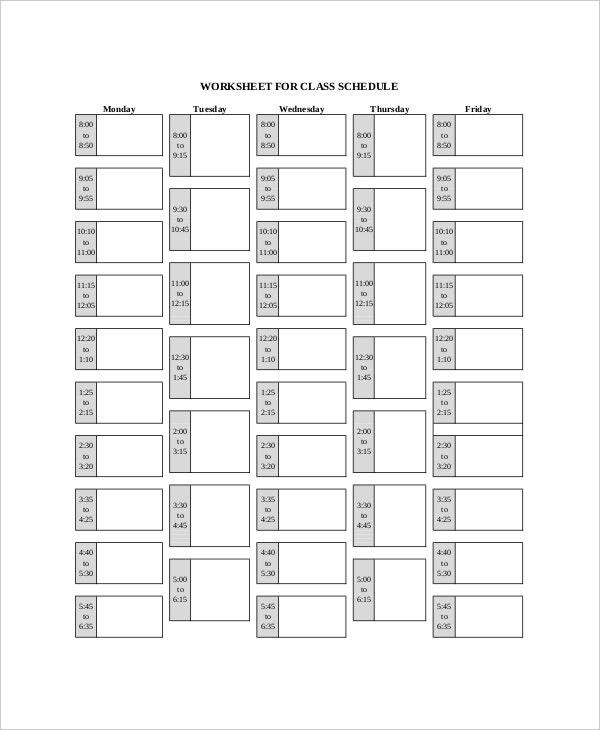 A weekly timetable schedule is the other general type of a Timetable Template. It is used for various activities planned to be undertaken within a period of one week. Such activities usually have a target and timeline for achieving them. 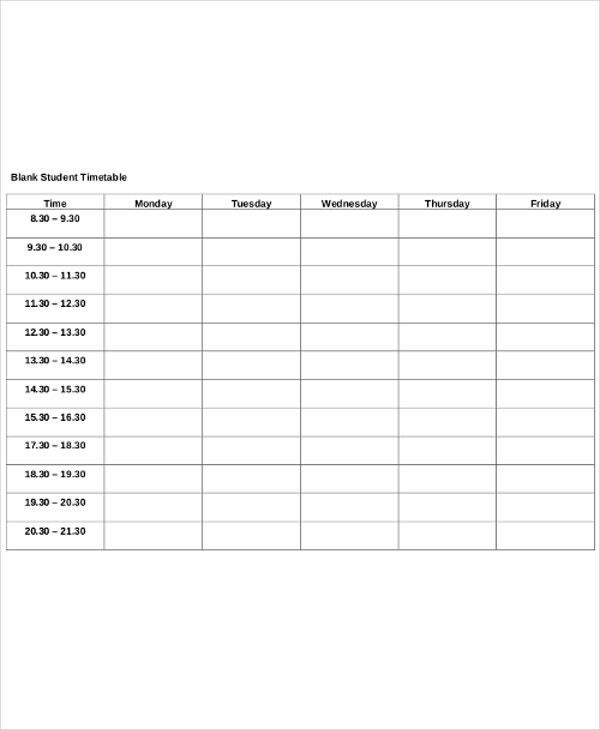 > What is a Timetable Template? 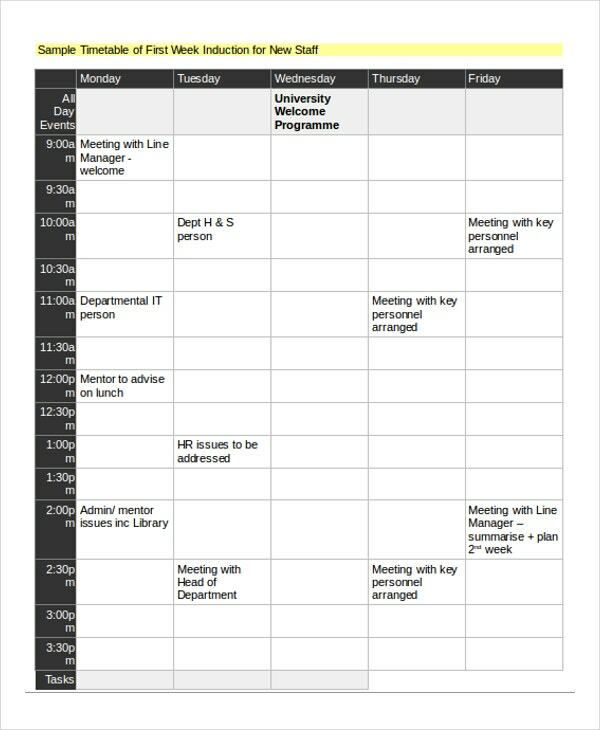 In brief, a document that contains all the planned activities together including the time allocated for each activity is a timetable. It provides an outline and the sequence of activities for a given period. The period could be a day, week, month or even a whole year. Having this document is very essential especially for individuals with a tight schedule involving many activities. They also benefit to a large percentage schools and institutions with many events running at the same time. School timetables are very common among many people. With a timetable, you can be sure of undertaking all the planned activities without leaving some out due to fixed schedules. 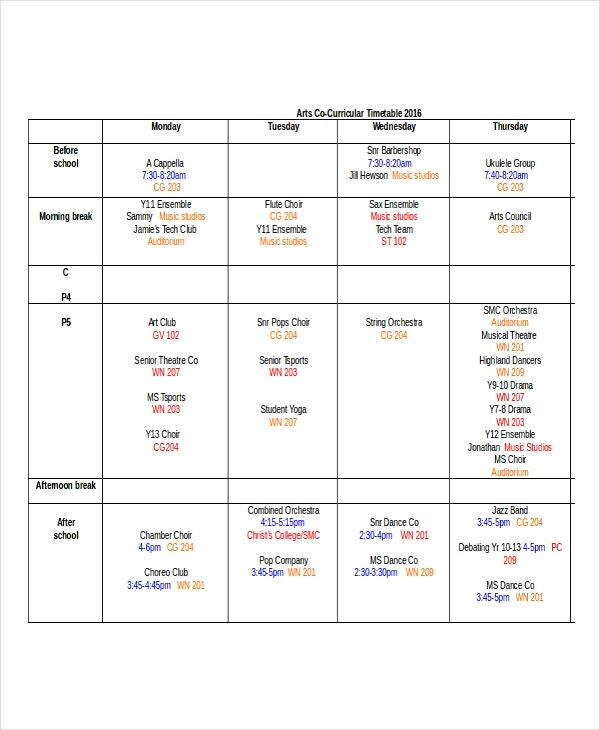 All planned activities are attended to within the planned period. This will allow equitable and fair attention to each task. In schools, they facilitate smooth flow of activities without duplication. 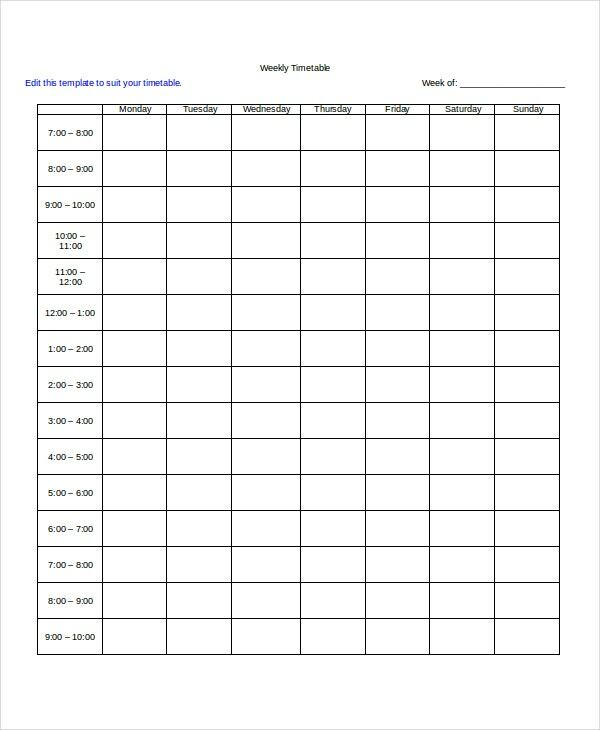 A revision timetable template enables one to revise effectively for any planned assessments; this ensures the passing of the tests. Project timetable provides an outline of the task planned thus creating a goal-oriented planning of activities. This keeps an individual on track and enables the achievement of the planned task. In addition to that, a project schedule enables or provides an easy medium for communicating with investors and potentially concerned persons. Creation of any template is dependent on the specific purpose intended for the item. The speculated function, therefore, dictates the plan and procedures to be followed when creating this plan. However, the advancement in technology and development of computers has led to the creation of automated software that generates these templates just by a click on the button. School and institution based table, however, are still created manually. This is due to the complexity of the items involved. You should begin the process by having a clear knowledge of what you are tasked. After, assemble the necessary items that will facilitate the whole activity. With this, you can build on the template. For those with automated software, the challenging task is feeding the information to the processor. For manual schedules, you will first have to gather all the necessary date including those of involved parties such as teachers and their activities. This will enable you to identify and fill or match appropriately with their assigned tasks. When compiling these documents, ensure that the data is realistic and objective. This involves ensuring that the individuals assigned are capable of handling whatever is assigned to them in a day. 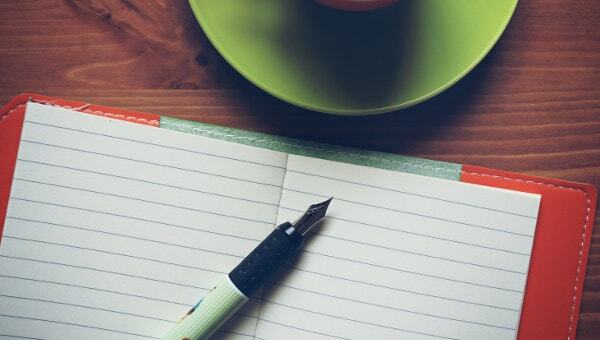 For revision template, ensure that you plan and read in accordance with your abilities and capability. Also, ensure that you concentrate and add more time to subjects you are weak in. Provide suitable breaks within the activities to ensure maximum output from individuals. Ensure that you do not create collisions of teachers in class or duties for school tables. Do include the concerned parties of possible. Do cover all the subjects in a balanced manner for revision timetables. Do not spend much time in one area. Also, provide an outline of the whole program in case of a project timetable. Do not overlook some critical sections.